What Are We to Make of Jephthah’s Tragic Vow? More than one reader, upon finishing Judges 11:29–39, has been overwhelmed by grief from this tragic story. At first glance it appears that Jephthah makes a vow to the Lord to offer as a burnt offering whoever or whatever comes out of his home when he returns home from battle. Specifically, the text reads as follows. 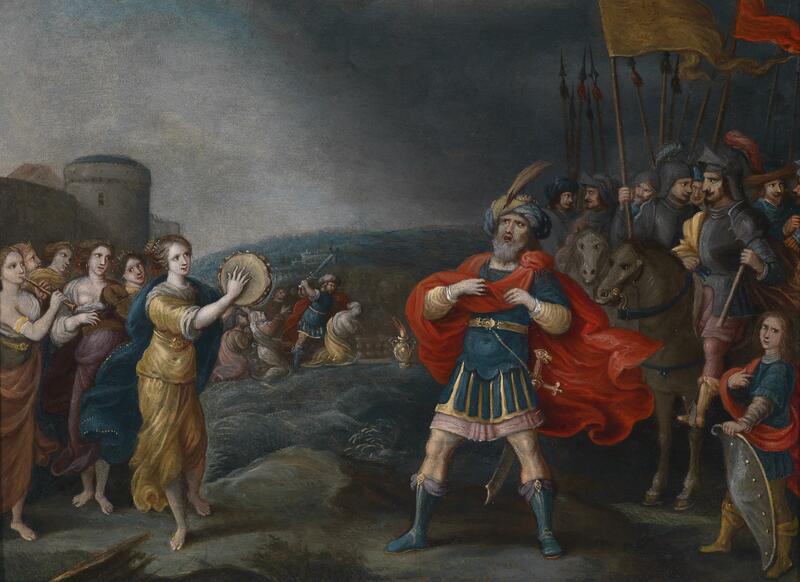 Even before one reads the rest of the story one might wonder why he would make such a vow, but the story turns to tragedy when Jephthah returns home from a successful battle and his daughter is the one to meet him. 34 Then Jephthah came to his home at Mizpah. And behold, his daughter came out to meet him with tambourines and with dances. She was his only child; beside her he had neither son nor daughter. 40 that the daughters of Israel went year by year to lament the daughter of Jephthah the Gileadite four days in the year. What are we to make of this tragic story? Did Jephthah really make a human sacrifice of his only daughter? Hebrew scholars are divided on this issue. Here are two contrasting opinions. Daniel Block, who wrote the New American Commentary on Judges and Ruth, believes that Jephthah really did make a human sacrifice of his daughter. Block argues that Jephthah was trying to manipulate God into providing victory over the Ammonites. Jephthah’s “haggling” with God ultimately backfired on him. Block contends that Jephthah had been combining the various religious beliefs of the region—many of which allowed for human sacrifice—with the Hebrew faith. In short, Jephthah turned out to be pagan instead of pious, and since this was his only child, his lineage was also stamped out through this tragic act. Another Old Testament scholar, John Sailhamer, however, disagrees with Block. He argues that Jephthah didn’t make a human sacrifice of his daughter, but rather devoted her to the service of the Lord as a perpetual virgin. Sailhamer argues that Jephthah’s vow is textually linked to the vows found in Leviticus 27:1–13. “There are two types of vows here. The first is the dedication of a person to the service of the Lord (Lev 27:1–8); the second is the dedication of an animal for an offering to the Lord (Lev 27:9–13)” (NIV Compact Bible Commentary). In the second type of these vows, only ceremonially clean animals could be offered to the Lord so, according to the Mosaic law, Jephthah could not have vowed “whatever” came out of his door for a burnt offering. Sailhamer also makes the argument that the text nowhere states that Jephthah actually made a human sacrifice of his daughter. The text simply states that he did to her as he vowed (11:39). So, what are we to make of Jephthah’s tragic vow? Who is right? Daniel Block or John Sailhamer? What lessons can we learn from this account? Let me suggest three. First, no matter which interpretation is correct (I, personally, am a big fan of John Sailhamer and so I side with his interpretation), we can know that God is not the author of evil (3 John 11). Even if we were to take Block’s position, the evil would lie at the feet of Jephthah and his rash vow rather than at the feet of God. Second, a vow is a promise and so a vow unto the Lord is a promise we make to God. We need to carefully consider the promises we make to God because when we make a promise to God, we are to keep it (Numbers 30:2). Whether it’s a marriage vow made before God or a vow to give a portion of one’s income to the Lord’s work, it is a promise made before the Lord, and we break those promises to our own shame and to our own harm. Finally, there is one human sacrifice that did happen for which we should all be eternally grateful. And this sacrifice can be attributed to God himself. “For God so loved the world, that he gave his only Son, that whoever believes in him should not perish but have eternal life” (John 3:16). God gave his only Son to pay the penalty that we owed so that those who place their trust (faith) in God would not perish but have eternal life. This sacrifice of the Son of God, who was fully God and fully man, was a part of God’s plan from the beginning (see Acts 2:22–24 below). While the idea of human sacrifice may disturb our 21st Century sensibilities, I, for one, am glad that God loved the world (“the world” includes you and me) enough to give his only Son. Jesus laid down his life willingly for us. “Greater love has no one than this, that someone lays down his life for his friends” (John 15:13). 23 this Jesus, delivered up according to the definite plan and foreknowledge of God, you crucified and killed by the hands of lawless men. 24 God raised him up, loosing the pangs of death, because it was not possible for him to be held by it. ← Did God really “hate” Esau?